This one actually started out as a Vue d'Esprit lesson with my son Ian. While working on it with him I saw the possibilities as a wallpaper. I worked up my own version and Ian said I could post it as long as I told everyone the original inspiration was his. So here's our first "collaboration". I hope you like it! When there is no sun, Mother Nature provides its own illumination. A dreamy landscape. "Was this inspired by Avatar?" It looks rather like something you'd see on Pandora at night. Beautiful, in any case. Honestly I can't believe this isn't rated the highest, in my opinion this is probably the best piece of artwork you have. In my opinion this is probably your best piece of art work it's absolutely amazing and beautiful, absolutely flawless. A red version of this would be spectacular. I am currently looking at a red version via a colorization filter and I am liking what I am seeing. A true red render, however would look much nicer. Ryan, you have outdone yourself. This work is absolutely gorgeous and inspiring. How coincidental that I was writing in one of my short stories for fun about an underground river and you posted this piece shortly after I had finished writing that scene. You put a picture for my story, unintentionally! Thanks again! "Awesome on Dual Screen !" Looks like Ian has got the gift. Nice one! I haven't been visiting your site for a while and I was amazed by the wonderful new works you have created - but THIS is the most awesome I've ever seen! Thank you for so many incredibly wonderful pictures, Ryan! This is beautiful. I love all your grotto renderings, but this is a different. As soon as Halloween is over, this is going on my desktop! Nice work Ian! Really alien world feel. I'd love to see some more collaborations with your son and yourself in the future. Maybe ian will take over for you someday and keep the Digital Blasphemy tradition alive! awesome job Ian! Hey Ryan, you continue to amaze me with your creations. I'm not sure how you'd go with this, but I think it would be cool to see a video screen capture of you making one of these pictures. It would really help to see how one of these amazing works of art come to fruition. Thanks you all your work. "This is my favorite piece to date!" Crop it to size, the composition is a little bit different and it works for me most of all. Definitely prefer the pickle jar version. "Reminds me of Tron water "
I like the pickle jar version. It's kind of like having a 'night' version. I love the darker version in the pickle jar! Any chance we could get a 960x854 version of the pickle jar for my Droid X? I like it. Can we see Ian's version? the water has good depth to it, but the walls seem to be lacking depth and texture. I noticed these as well in the 1366x768 one. I see them in the 2560 version, didn't look at others. On the pickle jar versions there's two black blobs in the glowy things, bottom left. Is that supposed to be there? The pickle jar image is darker and mysterious, and its pretty, but not as great as the original to me. I might use it sometime, but for now the original stays up. :) Great job though! great image.. but it seems to lack a bit of definition between rock and water... maybe its a depth perception thing? and surface of water is (it IS water,right? )is kinda odd. I like it, but it seems hazy to me. Is it because of all the tiny points of light in the back wall? There's too much blue light? My screen? I dunno, but if it was cleared up it'd be really great. I like this, It looks like a cool place to explore. Will there be any other varriations? Wonder what a green version would look like? I like this one pretty well - I'm a big fan of secluded and serene, as well as alien, and this one is all of those things. The flora and water are nicely detailed and intriguing. I have a high appreciation for your monochromatic images, though I do feel a mild lack of variation in terms of color with this one - I think a mild (and I do mean mild) hueshuft towards blue or violet, perhaps in the water, would be a nice effect. I hate to admit it but I don't know what i'm looking at. Am I looking inside a cave? Is that rock bordering the top or are those trees? I like the colour just can't figure it out what i'm looking at. The water surface texture reminds me of mixing water of different temperatures or salinity. The effect you have achieved with it is striking. 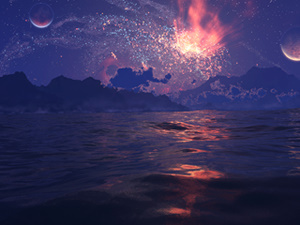 The environment you have created is truly inspired, and hints at so much, like the beautiful 'flora' and glowing water, yet reveals little about the actual world. Have you ever considered doing a sequence of pieces inspired in the same digital 'world' depicting different places which, when taken together, reflect on a greater whole? Just a suggestion for something a bit different than your seasonal 'cycles' to consider for the future. "Second the motion for 1600x900"
Just simply amazing! You should have Ian work with you more often if this is what happens! The stuff that dreams are made of as Bogey would say! Rated this a 10. Kudos to your son for an amazing idea. Can you possibly start making images in 1600x900 wide-screen? I cant fit the whole image in my screen...the images are either too small or too big. Really cool idea but I feel like this one isn't quite up to your normal standards yet. There's so little detail on the cave walls and in the shadows, and in the background, that it feels like this was made several years ago. The amount of ambient light "haze" also makes it feel a bit stifled instead of like an impressive luminescent cave. Some of your other works are so immersive that you want to sit and stare at them for hours, whereas this one you feel like you "get it" with just a quick glance. It's not bad or anything - I just think with some extra attention this one could really stand out and be a lot more special. I've played a bit of Half Life in my time. I know I wasn't thinking specifically of the game environments when I was making this, but I'm sure the influence is there subconsciously. I just wanted to add that this wallpaper looks magical. It's been a while since I'd seen a wallpaper that evoked that magical feeling. I love it! I saw this on in my updates and loved it on first sight! My favorite color is blue, but I would love to see maybe some green lightning bugs, or some other small dashes of color, as an accent to the lovely scene. Ian did a great job laying this out and providing enough of a vision for you to translate it into a wallpaper! Looks like DB could be a family business!! "Like a suggestion I was once going to post!" Earlier in the year I was going to suggest to you an idea for a wallpaper... I thought one day "why does life have to exist on a planet similar to ours? ", then I started thinking about what life would be like on a totally different planet to ours, and in my mind I came up with a fake planet that had one side permanently in the sun, and the other permanently at night. What would plants and animals look like in the darkness, how would they cope? It was that second that I had a sudden image pop in to my head of beautiful, glowing multi-coloured plants and insects (think Fluorescence Bloom, but with a huge amount of plants such as trees, bushes, shrubs, etc.). It was a very digitalblasphemy-esque picture, and I wanted nothing more than to see my vision come to life. But then I remembered that your work is so good because of the creativity that you put in to it. It's your style... and that's why your website and images are so popular. If you blindly followed someone elses idea/picture, it wouldn't be your own work. This wallpaper is similar in many ways (dark setting, glowing plants, etc.) - but I wish that the ceiling was cleared to make way for a starry night and larger plants like trees were scattered about in different colours (not just blue). Keep doing what you do best Ryan, and make sure you train your son in the art - my lifetime subscription ends in 2099, and I want to resubscribe that same year. Could you add some lightning bugs? Other than that it looks great! 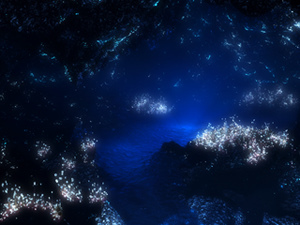 A beautiful scene; no complaints; my pedantic nitpick is that it really doesn't look like there are any stars in the picture; more like luminous plants for the surroundings, and perhaps luminous algae in the water. 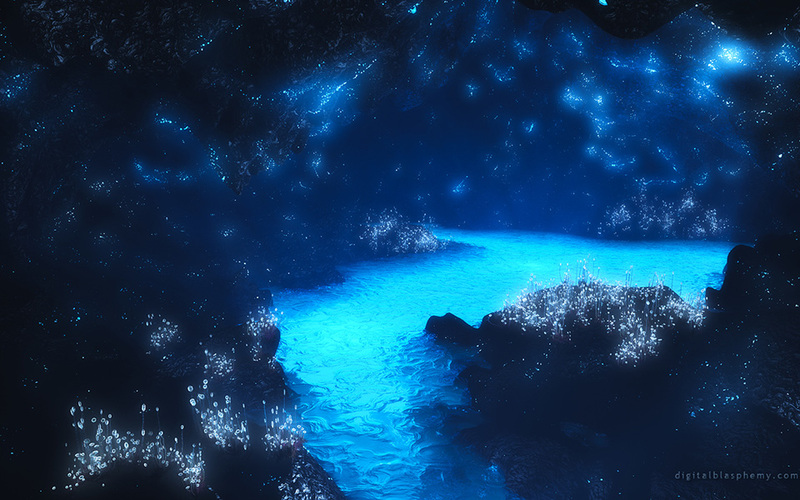 Glowworms on the ceiling of a cave would give the same impression, but wouldn't light the water. Maybe there's a big moon overhead to light the water, but starlight wouldn't do it. First:: looks like Ian is inheriting your talent. Second: Most of us will never, even with training, be as talented as you (skill can be developed, but talent is harder), but I wouldn't mind some skill. Ever thought about a side business where folk sign up, for a fee, to get monthly tutorials and/or behind-the-scenes "how it was made" videos of a recent wallpaper? Watch out! Ian may take db away from you lol. I love this one. Send my "thanks" to Ian for that great inspiration. Hey that's my name! Are you an imposter or what? I agree this is beautiful, and I think the simplicity is what amplifies that fact. There is honestly nothing more you could revise that would help any. That should be a compliment in itself. This is really beautiful Ryan! "Reminds be of New Zealand"
This reminds me of the Waitomo Glowworm Caves in New Zealand. I was there in 1987 and loved it. We were not able to take any pictures so this is the best representation I could find of it. This one is very dream like and very well done. I like it a lot. Have you considered doing some slightly different colors such as a gold-like color? It is a beautiful piece; it's very serene. when I clicked on my email and opened this render it took my breath away. You can tell Ian that his idea was beautiful. Great job guys. When looking at this render it feels like a secret hideaway to sit and escape from the world. It has a really peace feel about it. It's simply beautiful. Absolutely stunning. Puts me at peace just looking at it. Wow. Cannot wait to get home tonight and change my wallpaper. "A sign of things to come?" I look forward to more collaborations Ryan, if your son maintains an interest in this and follows your footsteps, with your guidance he might become a real master! Love this one. Yay! A nice blue wallpaper to complement my blue LED's coming from all my hardware. Nice work! "Thanks for the discount, Ryan!" Just upped my membership for another year. $5 off anything these days is a big deal. Thanks!!! This kind of art is what drew me to DB in the first place. I like everything you do, but these surreal landscapes are my favorite. It looks like a pool of mercury; don't know if you thought of Qin Shi Huang's tomb as you created it, but it's what it made me think of -- jeweled stars above and rivers of mercury below. I would like to give this one 9.5. I can not see this one being done over in another season or color scheme. The blue and the highlights are what make this for me. The soft haze didn't hurt either. Hey... maybe try to make a less blurry render of this? It seems like there is a mist or something in the grotto.. it would look really cool if it was more crisp! It's great to see that your son has inherited your eye for beautiful scenes. I love this, and I love that he gave you the inspiration. Keep it up, Ian! What a lovely collaboration! Please tell Ian he has a true eye for beauty. Thank you both for sharing this with us! You might want to get some more ideas from Ian... I mean if he can inspire a new direction and give you a few new ideas all that much better. And I love your Blue modes!!!! This is beautiful! For sure, this will be my next wallpaper as soon as the multiscreens are added. Thanks, Ryan, and keep the good work! "You should collarborate more often." Seriously though, it looks fantastic. Very ethereal. I like this one a lot. It almost seems like a bit of a compromise between realistic scenery and an abstract. The water is kind of strange, but it adds to the appeal. On a side note, as of this comment, the RSS feed link to this is wrong (at least through Google it's pointing to the wrong page). Wow, this wallpaper is beautiful! Congratulate Ian for us! I think it is so sweet that you're teaching him to do what you do. We look forward to seeing more "collaborations". tell Ian to give you more ideas--this is brilliant!!! This is my favorite wallpaper in awhile. Beautifully done. Ryan, this has to be my all time favourite. Thank you! Good work. But did you forget about rendering a 1600x1200? Or did you drop that resolution? Highland Summer is still in the gallery, but I don't want to "feature" it until my new render is finished. It's chugging away slowly on my other box, but should be finished sometime this week. I love the way the texture of the water - very crystalline. The shadowed areas really give the illusion of space. "Love it! (with a question)"
This one looks fantastic! Nothing as far as change requests comes to mind at the moment. I'd be happy if it stayed the way it is. Also, I was wondering what happened to Highland Summer. Did you take it off to rework it? Were you unhappy with it? I rather liked it. The 1280 x 1024 links is there now. Thanks for the heads up! Absolutely wonderful! Gives you the feeling that you are looking at something no one else has seen; except that only you have special permission to see. Great work from Ian and yourself. Looks awesome, but where's 1280x1024?